When was the last time you reached a point in the day where the Sandman showed up prematurely from its vampire coffin and lulled you into closed-eyes of boredom? If you have kids, what parent doesn’t know the siren song, There’s nothing to do. Kids naturally come with the attention span of a gnat, so boredom is one of the hazards. For adults, tedium and its sidekick, bored, is the pheromone that attracts Sandmen to daylight hours. I’ve lost count how many times I considered stapling my eyes open in corporate meetings. As a writer, quaffing caffeinated beverages is the shield of choice, though a flimsy one if the story isn’t going so well. I knew something was wrong when I thought to myself, would anyone living in a dystopian world, ever be bored? Clearly a time to walk away from the word processor. Imagine my surprise to discover there is a field of study dedicated to the science of boredom. Little is known how boredom affects the brain, but a few University Psychology Departments are floating theories it may be a failure in the neural pathways that control attention. I couldn’t help chuckling to myself. Has the research community been so bored with trying to find credible fields of study, they have decided to explore why they’re bored? Apparently, boredom is a fascinating field, which in itself seems an oxymoron. Last I looked, we blamed it on variations of attention deficit issues. Think of all the meds I could have spared myself had I’d known I was just bored. I’d have loved to been a fly on the wall when the proposal was made to fund this work. 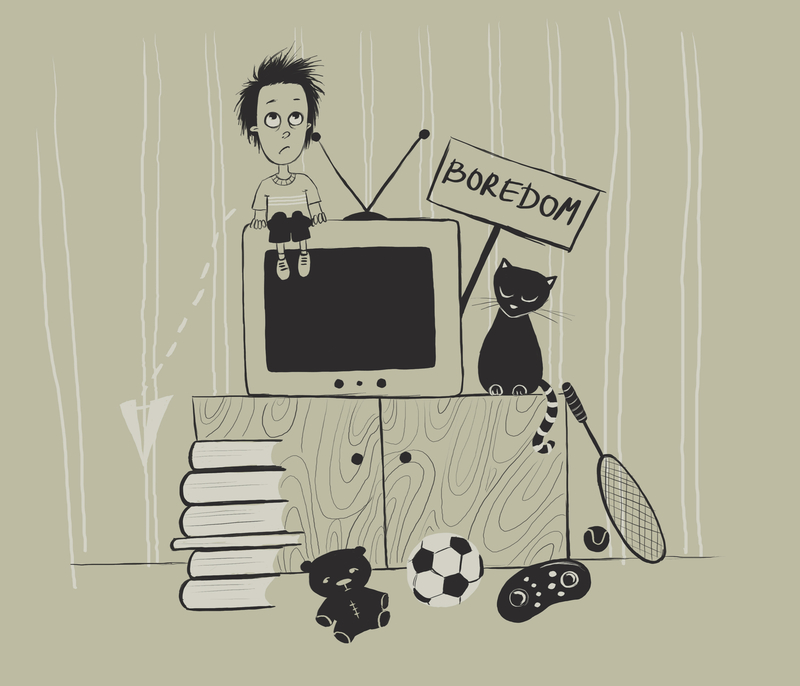 “Our hypothesis is that boredom is an unhealthy premise, which can lead to expensive medical treatments and potential strain on the health network. See, you yawned when I said that. Let me take your pulse.” I’m hoping it is funded by private grants, and not a contributor to double-digit inflation for college tuition. Setting up the proper control environment in this exciting, new field, described having test subjects watch videos of a man mowing the lawn, listening to monotone voice-overs or folding laundry. Seems an elaborate process that could have easily been accomplished by confiscating a teenager’s cell phone and wait for the whining to commence. Next time my wife asks to help her with laundry, I’ll tell her it’s bad for my health. An addiction to today’s media overload and the treadmill of never-ending need to be actively engaged, has short wired our ability to tolerate moments of calm. I grew up in a time when kids had to self-initiate things to do. If we were bored, we’d sure as hell not mention it to mom or dad, or we’d get drafted for chores. I can see the value of understanding job environments prone to unsatisfying activities like data entry, assembly lines, or working at the local burger joint. China has entire cities of assembly type work where the suicide rate is disturbingly high. When faced with having to visit Aunt Gertrude and her collection of ceramic figurines, I can recall expressing my disdain with phrases like – just kill me. Aside from the potential to be a workplace hazard, I’m not convinced boredom is such a bad thing. Maybe we’ve confused boredom with a human need for serious downtime not associated with sleep. I’d read somewhere that the average human today receives more sensory input in one day than a middle-ages human experienced in a lifetime. No wonder we can’t remember anything. If we don’t put some space in our heads to feel bored on occasion, how do we find space in the chaotic rumpus-room in our heads for new ideas to evolve? We need more field study, not the research version, the kind where we lay on our backs in a field and study cloud shapes, or wait for shooting stars. So back to what drove me away from the word processor. Would someone living in a dystopian time ever be bored? Many folks long for a simpler time, devoid the barrage of mind-numbing media input. If it’s anything like the stories I write, it’s not the world of your grandparents and it’s not a fun place to be. Lots of down time when hiding, hiking long distances for water, sitting long hours in the shade with an empty belly, or tedious slave labor of an autocratic government, to name a few. It fits the “unpleasant state of wanting, but being unable to engage in satisfying activity” definition, but our thoughts would be locked in a heightened state of survival, fueled by fear, melancholy, deadened by hunger and pain, still wishing for the old days. We can blame the environment , but most of the blame should be reserved for those who let it happen. It is sad to see our “research dollars” going for such mundane nonsense. That was my reaction as well, Mary. Surely our research dollars could be better spent. It is another reminder to me of how isolated we are from investing in things that are important, or should be. Thanks for adding your view. I meant also to say I loved your article though!